Home > Topics > Two-glazed lion figure by Chôjirô in the collection of the Raku Museum has been designated as the Important Cultural Property. Two-glazed lion figure by Chôjirô in the collection of the Raku Museum has been designated as the Important Cultural Property. 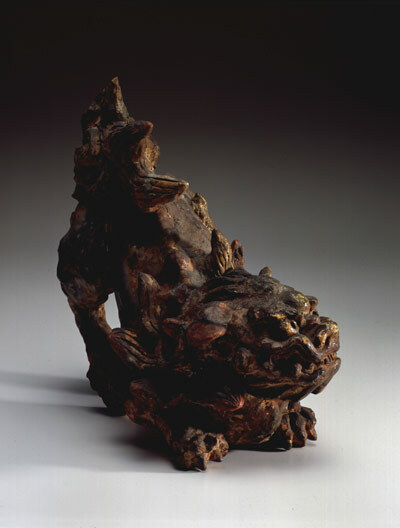 Two-glazed lion figure by Chôjirô in the collection of the Raku Museum has been designated as the Important Cultural Property. The figure has a carved inscription reading “made to order by Chôjirô in the spring of the second year of the Tenshô era” and is supposed to have been made before the production of tea bowls. The figure has a highly sculptural quality, charged with animated dynamism and vividness in direct contrast with a static expression of his tea bowl in which decorativeness and variety of form reduced to its minimum. A recent study revealed that it was two-colour glazed over a white-slipped body. This glazing technique originally derives from sancai wares of the Ming Dynasty China from the Henan Province and shares its root with overglaze enameled Kyoto wares, which renders this work even more historically significant.